The city is giving the pavilion, in Flushing Meadows-Corona Park, Queens, a $14.25 million redesign that will debut in fall 2019. The famous—and famously neglected—New York State Pavilion in Queens is poised for a major revamp. 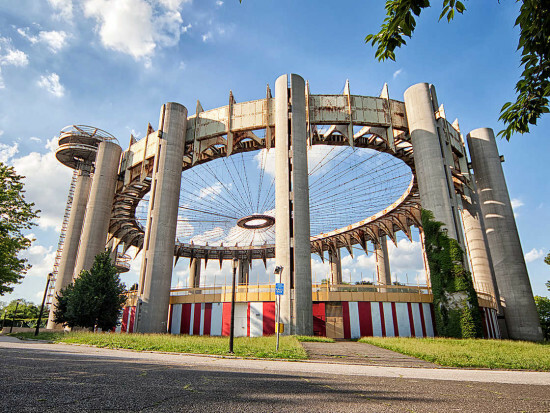 The city last week announced it is giving the pavilion, in Flushing Meadows-Corona Park, a $14.25 million redesign. Originally conceived by Philip Johnson and Lev Zetlin for the 1964 World's Fair, the pavilion is a far cry from Johnson's Glass House but became a New York City icon nonetheless. Now, though, the National Register–listed item is largely abandoned, looming over other World's Fair infrastructure that has been successfully incorporated into the park. “The scope of the project includes structural conservation work on the observation towers, waterproofing of the tower bases, improvements to the electrical infrastructure and architectural lighting of the observation towers and the Tent of Tomorrow,” a NYC Parks Department spokesperson told the Queens Chronicle. This is far from the first time Johnson's pavilion has made news. An ideas competition last year solicited proposals for a revamp that ranged from the practical to the fanciful, while in 2015, the pavilion's Tent of Tomorrow was painted American Cheese Yellow to match its original color scheme. The Parks Department has approved the schematic design, and Queens Community Board 7 signed off on the plans. Now, other city agencies are reviewing the project for approval. The work, however, depends on a successful bid for the project. If all goes well, construction is scheduled to start next spring and wrap in fall 2019. This is the sixth in a series of guests posts that feature Archtober Building of the Day tours! As it stands today, the New York State Pavilion looks like it belongs in outer space—a little out of place but powerful in its presence. 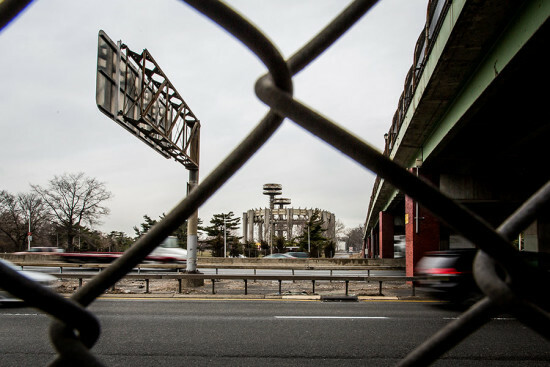 Anyone new to town who is driving on the Long Island Expressway or riding the train to Citi Field probably doesn’t give much thought to the oddly shaped structure, its historic significance, or the fact that it sits in the largest park in the borough. But as a huge fan of old buildings, when I first saw it just over a year ago, I was curious to know what this carnivalesque piece of architecture was doing in the middle of—what felt like, at the time—nowhere. By now I’ve educated myself on Queens history and have finally taken a tour of the famous fairgrounds with a crowd of Archtober enthusiasts. 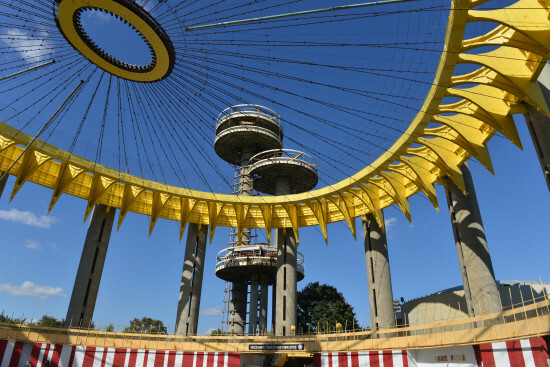 My initial observations about it were close: The New York State Pavilion is reminiscent of a big top circus; it was built for the 1964-65 World’s Fair. Originally designed by renowned architect Philip Johnson, the Pavilion is one of the city’s most iconic midcentury relics and a defining feature of the Queens skyline. 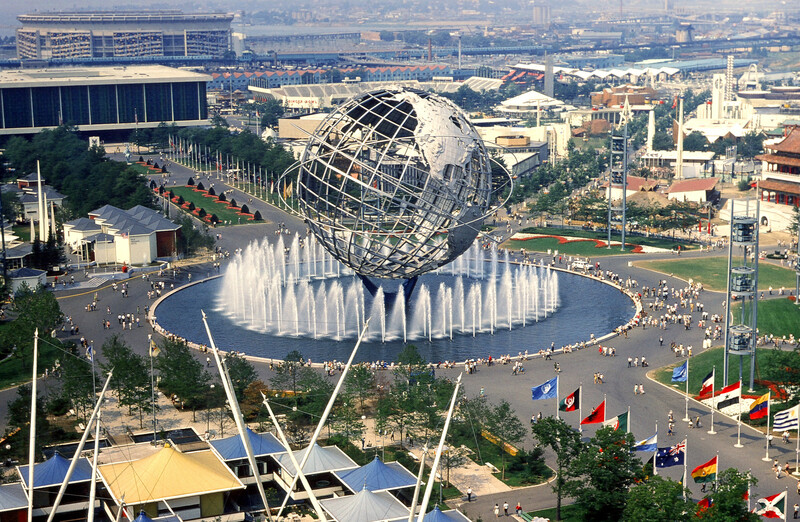 It can be seen from the window of a plane on its way to LaGuardia Airport or from the numerous highways that encircle Flushing Meadows-Corona Park. 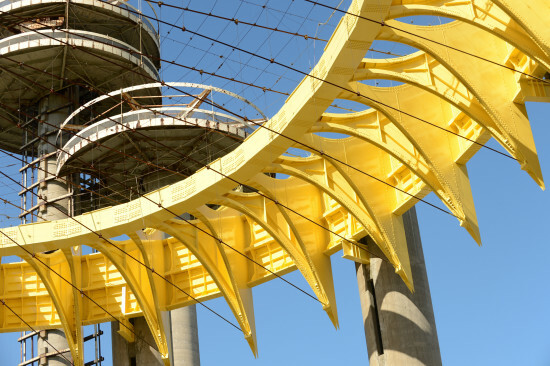 The Pavilion is a concrete and steel structure made up of three distinct parts: a theater, a 226-foot tower with three observation decks, and a 100-foot high, spiky, bright yellow, open-air elliptical ring. These constructions were once known as the Theaterama, the Astro-View Towers, and the Tent of Tomorrow. Today’s tour was led by five passionate members of the New York State Pavilion Project: Jim Brown, John Piro, Gary Miller, Mitch Silverstein, and Stephanie Bohn. Their grassroots effort is dedicated to restoring and repainting the structures, as well as bringing awareness towards the Pavilion’s future—an idea that’s received a lot of attention lately thanks to the support of Queens Borough President Melinda Katz. While these gatekeepers regularly host open houses at the Pavilion, today’s sneak peek inside the stately structure felt more intimate. As we stood inside the ring, clearly deteriorating due to weather overexposure, I felt a sense of energy inside the place. Though now empty, I could imagine over 50 million people flooding the fairground in the early 1960s. Some fellow tour-goers had actually been to the Fair themselves and could recall personal memories inside the Tent of Tomorrow, like walking over the giant Texaco map of New York State or staring up at the stained glass ceiling. The Pavilion even game me serious New York State pride, and I’m from Kentucky. According to our guides, Philip Johnson once said that he loved the Pavilion more as a stand-alone, derelict structure than when it was at the height of its heyday. And much like it was in 1964, the building is the main attraction. Based on today’s tour, the people who are dedicated to preserving this national treasure seem to feel the same. About the author: Sydney Franklin is a content producer at the NYC Department of Design and Construction. She recently graduated from Syracuse University with a master’s degree in architectural journalism. 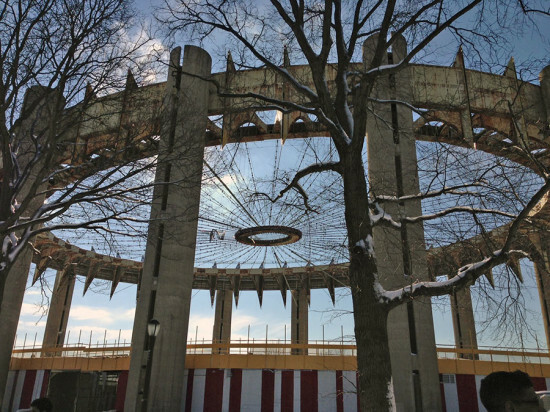 After decaying for years, the New York State Pavilion from the 1964 World's Fair is getting some TLC. 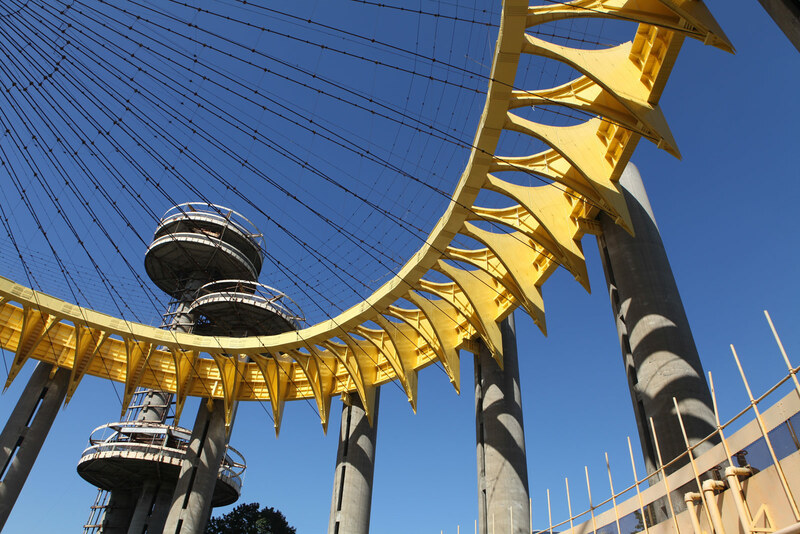 The New York Times reported that $5.8 million was allocated in New York City’s budget to stabilize the Philip Johnson–designed pavilion in Queens. A NYC Parks Department spokesperson told the Times that the exact use of the money has not yet been determined yet, but it will likely go toward electrical and structural work at the site’s iconic towers. The decaying Tent of Tomorrow will be getting some love as well. According to engineering studies from the Parks Department, it would cost an estimated $14 million to raze the pavilion, $43 million to stabilize it, and $52 million to restore the towers' elevators. Any attention to the park is a good sign, but considering the high cost of doing just about anything to the pavilion, this is a relatively small investment. But it is a start.